Download and install latest Dell Inspiron 7786 I7786-7199SLV-PUS drivers for Windows 10 64 Bit to get your laptop operate correctly. Dell Inspiron 7786 I7786-7199SLV-PUS is 17.3 inch 2-in-1 laptop powered by 8th Generation 1.80 GHz Intel Core i7-8565U quad-core processor and discrete NVIDIA GeForce MX250 graphics video card with dedicated 2GB GDDR5 video memory. 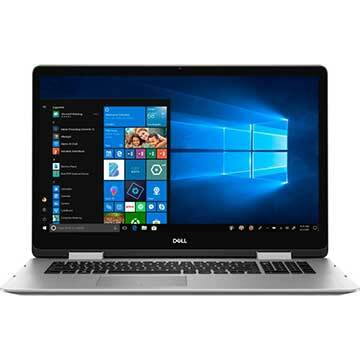 This Dell Inspiron i7786 notebook PC comes with 16GB DDR4 2666MHz system memory and 1 TB 5400 rpm SATA hard drive and 16GB Optane solid state drive to store your files, musics, videos, and other documents. This mobile computer features 17 inch Full HD (1920 x 1080) IPS screen display, 802.11ac 2x2 WiFi, Bluetoot, HD web camera, Fingerprint reader, SD Card Reader (SD, SDHC, SDXC) slot, USB 3.1 Gen 1 Type-C port, HDMI Out 2.0 port, USB 3.1 Gen 1 port, stereo speakers with Waves MaxxAudio Pro. and integrated 4-cell 56 Whr battery.